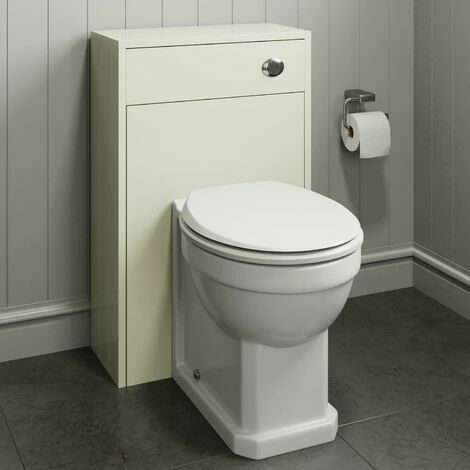 The Park Lane Ivory Traditional Concealed Unit and Toilet is a simple way to make your bathroom easier to keep clean, and so safer for your family's health. Not only that, this elegant unit will transform your bathroom into the most style. The simple concealed unit hides within the tank and flushing system. It has clean sleek lines with a minimalist appeal, and the soft ivory colour combines with many different decors and colour schemes. At the top right-hand corner, the -design chrome flush button offers two different flushing options. The toilet has a more solid form than a normal toilet, making it much easier to keep clean, and as it fits flush against the unit, which in turn sits tightly against the wall behind, and sits firmly on the floor, the space where pathogens can hide and propagate is greatly reduced. This concealed unit measures 500mm wide by 250mm deep and comes fully assembled so installing it is easy, and with a ten -year guarantee you will be able to enjoy many years of trouble-free service with style. Creating a luxury bathroom is a lot easier than you think especially if you're smart with your furniture selections. Our traditional bathroom furniture is delivered to you as fully assembled units. taking the stress out of putting it together and meaning you can get your new bathroom set up quickly and efficiently. When buying products for the bathroom you need to know that they're going to stand the test of time. This product comes with a fantastic 10 year guarantee against any manufacturing defects.